SOHW-1633S can also support the latest DVD+R DL Double Layer burning technology (SOHW-1613S doesn't support DVD+R DL Burning). Via SOHW-1633S you may record 8.5GB data or 4-hour DVD-quality video on one DVD+R DL disc, with double recordable capacity than previous single layer DVD+R disc (4.7GB, 2-hour DVD Video). You don't need to prepare 2 blank DVD+R discs to backup the same-size contents. The DVD Video playback of DVD+R DL discs is workable on current DVD-ROM drives & DVD players. 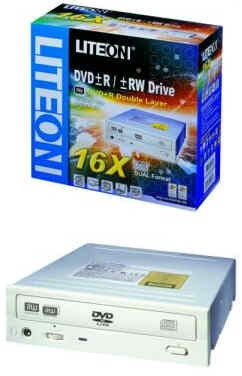 SOHW-1633S/SOHW-1613S is not only a powerful DVD Rewriter but also an Ultra-Speed CD-RW drive. It can write CD-R media at 48X maximum, rewrite Ultra-Speed CD-RW media at 24X maximum, and read CD-ROM media at 48X maximum. SOHW-1633S/SOHW-1613S has the best CD-R & CD-RW writing/re-writing performance in the current market of 16X DVD Dual Rewriters. No matter what you want to backup important or personal data from (digital still camera, digital camcorder, TV, etc. ), SOHW-1633S/SOHW-1613S is your best choice for recording large volumes of DVD audio & video. An amazing LITE-ON 16X DVD Dual Drive can meet your desires for DVD title creating and multi-media applications on PCs. Built-in SMART-BURN technology provides buffer-under-run-free function and great media compatibility for high-speed writing DVD+R / DVD+RW / DVD-R / DVD-RW / CD-R / CD-RW media. Innvative SMART-X technology provides smooth & stable Audio CD/DVD/DVD playback and high DAE/VCD/DVD data extraction. 2MB buffer memory is available for stable DVD recording. Power saving function is also ready. ◎ Weight : *1 SMART-BURN : Smart Monitoring & Adapting Recording Technology for BURNing.